The cytotoxicity of formulated nanoparticle complexes of different fatty acids (oleic, eliedic, Cis-vaccenic, Trans-vaccenic, and linolenic acids) in the presence or absence of whey protein isolate (WPI) was investigated in this study. Nanoparticle complexes formed with WPI was examined for surface tension, circular dichroism (CD), turbidity and Cytotoxic activity. Surface tension values were decreased with adding fatty acid to WPI. This would indicate that WPI can bind greater amount of fatty acid. Cis-fatty acids such as oleic, cis-vaccenic and linolenic caused higher decrease in the surface tension of WPI nanoparticles than that of trans-fatty acids (eledic and trans-vaccenic acids). The tertiary structure of protein (WPI) was lost and changed from fold to unfold after binding with fatty acids. The changes in protein structure would be correlated to exhibit a cytotoxic activity to tumor cells. All formed protein WPI/fatty acid complexes presented lower turbidity measurements compared to the fatty acid only at same concentration. The turbidity values for nanocomplexes of WPI/fatty acids were lower confirming higher ability in binding fatty acids. All nano complexes formed of WPI/fatty acids exhibited a cytotoxic ability as a lysis in erythrocytes. The cytotoxic activity of WPI/fatty acid complexes was almost as found with α-LA complexes. Nanocomplexes can be formed from WPI with good cytotoxic effect to tumer cells using cis-vaccenic and linolenic fatty acids comparable to oleic acid. It was a new interesting observation being that the nanocomplexes formed of WPI with fatty acids has a comparable cytotoxcisty to that of α-LA and β-lg and can be used in tumor therapy. Whey proteins which are valuable by-products from cheese industry are widely used in a variety of foods for their superior nutritional and functional properties. Whey protein gels may be used as pH-sensitive hydrogels for the controlled delivery of biologically-active substances because their entirely biodegradable and there is no need for any chemical cross linking agents in their preparations . The interplay between biopolymers and smaller organic molecules, such as lipids, at different surfaces is of fundamental importance to various biological processes. Molecular interactions between protein and lipid or lipid-like molecules are central to one of the most important functions of protein, namely the adsorption at biological interfaces, and the structure of bio-membranes [2-4]. In the last few years, a remarkable apoptotic-like activity towards cultured cancer cells of a complex between the calcium-free form of human α-LA and oleic acid (OA) has been described . The complex could either be isolated from human milk  or formed on a diethylaminoethyl (DEAE) trisacry column equilibrated with OA . The complex was named HAMLET (human alpha-lactalbumin made lethal to tumor cells) and defined as a complex between partially unfold α-lactalbumin and oleic acid. When tested against several different cell types, HAMLET showed strongest activity against tumor cells, whereas mature differentiated cells were not affected . Three molecular events are involved in the conversion of α-lactalbumin to HAMLET: protein unfolding, fatty acid binding, and formation of the biologically active complex. HAMLET was discovered by serendipity. During studies of antiadhesive molecules in human milk, tumor cells shown undergo substantial morphological changes when mixed with casein. The tumoricidal activity in the casein fraction was obtained after low pH precipitation of human milk and the protein component was identified as α-lactalbumin, α-lactalbumin acting as a substrate specified in the lactose syntheses complex, but with no known tumoricidal activity. The HAMLET-type complexes, with their strong potential to target undesirable cells, were discovered only two decades ago and since then the HAMLET field has widened in scope, acquiring new members and enriching our understanding of the basic principles underlying protein self-assembly and acquisition of new functionality. In contrast to human milk, no similar naturally occurring activity was found in bovine milk. However, it has been possible to make a complex between bovine α-LA and OA called BAMLET (bovine alpha-lactalbumin made lethal to tumor cells), capable of inducing cell death in trans-formed cells in vitro. Meanwhile, the OA complex retains its activity upon replacement of human α-LA with closely related amino acid sequences. For example, human α-LA can be replaced by bovine, equine, porcine, or caprine α-LAs, proteins that share 76 - 79% sequence identity with the human protein . It is, therefore, of interest to investigate conditions for generating BAMLET-like activity that could potentially modulate the growth of cells. Therefore, the aims of the present study were to investigate the potential uses of whey proteins as a base of nanoparticles and its efficiency for the delivery of bioactive compounds. The ability of bovine whey protein to formulate a nanocomplex with different unsaturated fatty acids that have a cytotoxic activity was investigated. Thus, the study was planned to formation and properties of nano complexes from whole whey protein (WPI) preparation and different faty acids (oleic, eledic, cis-vaccenic, trans-vaccenic and linolenic). Whey Protien Isolate (WPI) was purchased from Arla Foods Ingredients AMBA. Nnvium. DK-6920 Videbaek. Denmark. All of fatty acids used in this study (oleic, eliedic, cis-vaccenic, trans-vaccenic and linolenic) were purchased from Sigma-Aldrich Co., St Louis, USA. In this study (at Denmark Laboratories) whey protein isolate (WPI) was dissolved in double distilled water at 4°C. The WPI concentration was determined using Spectrophotometer at 280 nm. Samples of WPI solution for suspended fatty acids and heat treatment were diluted to a final concentration of 1 mg/mL in a final buffer concentration of 1.516 M glycine at pH 9. Oleic acid was dissolved in sodium carbonate (Na2CO3) 0.1 M while eliedic, cis-vaccenic, trans-vaccenic and linolenic fatty acids were dissolved in ethanol at concentration of 5mg/ml and stirred until complete solublization. Mixtures of WPI solutions with different fatty acids were prepared as described by Kamijima et al. . 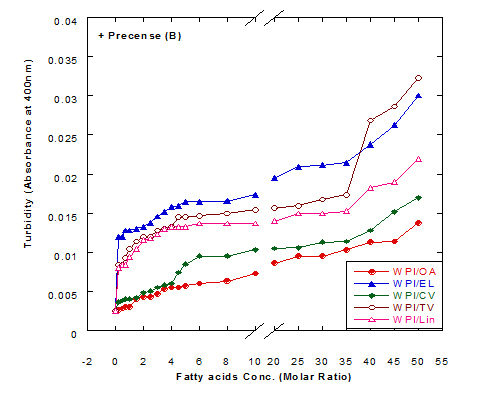 Different fatty acids were directly suspended into the (WPI) protein solutions of different concentration as a molar ratio. These mixtures were heated at 60°C for 15 min. to facilitate dispersal of the fatty acids and structural change of the protein. After incubation for 15 min, the mixtures were cooled to room temperature (20°C). Surface tension for all samples were measured at room temperature (20°C) using the Pendent drop (KSV Instruments', CAM 101). The measurements were repeated six times and an average value was obtained. Spectra of CD was measured with a Jasco J-810 spectropolarimeter (Jasco Spectroscopic Co. Ltd., Hachioji City, Japan) equipped with Jasco PTC-348WI temperature control unit. The pass length of the optical cuvette was 10 mm for 250 – 320 nm (near UV) and 1 mm for 190 – 250 (far UV), respectively at 37°C. The wavelength setup was; the response time 2 sec. ; and the scan rate 100 nm/min. Eight scans were recorded and averaged for each spectrum. The WPI was 38.62 μM and 3.862 μM for near UV and Far UV, respectively. The turbidity of protein solutions and protein fatty acid mixtures were measured at 400 nm using Spectrophotometer. The interaction effect of different protein/fatty acid complexes on erythrocytes as indication of cutotoxic activity was examined as described by Dobrovolskaia et al. .
Data of the three experimental were analyzed using the Statistical Analysis System . 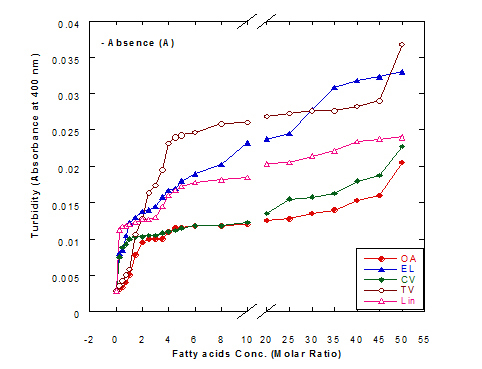 The surface tension values of solution from WPI nanoparticles with different fatty acid in complex are plotted in Figure 1, as a function of fatty acid in the presence or absence of WPI after heating at 60°C for 15 min. The value of surface tension for the solution of WPI nanoparticles (WPI in buffer) without oleic acid was 68.7 mN/m while that of buffer only was 71.9 mN/m. It could be seen from Figure 1 that adding oleic acid (OA) in concentration of 0.25 MR to WPI solution in glycine buffer lowered the surface tension value from 68.7 to 57.1 mN/m. On the same hand, the same addition of OA concentration into buffer only caused a reduction in surface tension value from 71.9 to 71.1 mN/m. The surface tension value of WPI solution decreased as the concentration of added fatty acid was increased. The data significantly decreased by adding different fatty acids, reflecting the affinity of WPI nanoparticles to bind the fatty acids. These findings were noticed with all fatty acids used with different effect in lowering the value of surface tension. The data presented in Figure 1 also cleared that the complex of WPI with any of fatty acids used in glycine buffer solution (pH 9) lowered surface tension value than that of fatty acid only. Changes in surface tension values were more noticeable with significant decrease in the first stage of fatty acid addition starting from 0.25 MR up to 3.5- 4.0 MR. There were other two different stages could be observed of the obtained data. The medium stage started from 4.5 MR up to 25 MR, from which the surface tension continued to decrease with increasing the added ratio of fatty acid but at lower rate than that of first stage. The third stage started from 30 MR up to the end titration process at 50 MR, from which there were very slow rate of reduction in surface tension values. These observations confirm the previous findings that the changes in surface tension occurred due WPI/OA nano-complex were significantly faster at the first stage than that at third stage. The faster rate of reduction in the surface tension is directly reflecting the faster adsorption; and binding site still not saturated and can bind more concentration from fatty acids. 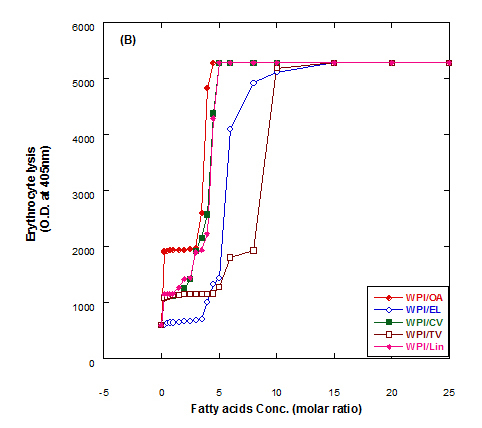 The data presented in Figure 1 also refer that WPI nanoparticles have high affinity to bind different fatty acid as well as oleic acid. It could be also high ability to bind oleic acid more than eledic acid or any trans conformation fatty acids. In comparison with oleic acid, Figure 1 illustrates the effect of different fatty acids in changing the surface tension value of WPI nanoparticles in glycine buffer solution. As can be seen, cis-vaccenic and linolenic fatty acids were mostly close to oleic acid in binding with WPI and have similar effect in reducing the surface tension values. Generally, the increase in binding of fatty acids to WPI nanoparticle complex reflects an increase in complexes availability to kill cancer cell or have more turmcidical effects. The effect of additing fatty acids to the WPI nanoparticles (1 mg/ml) on surface tension was depended on fatty acid concentration. In general, addition of WPI nanoparticles led to much faster decrease of surface tension as compared to the solution without WPI nanoparticles (the cis fatty acids have more ability to bind with WPI nanoparticles than the trans fatty acids). The reduction in surface tension value was always higher with WPI nanoparticle complex than that without WPI. Therefore, the WPI/fatty acid complexes have higher ability to kill cancer cell more than fatty acids only. Fatty acids in the cis conformation are U-shaped around the double bond, with both carbon chains projecting in one direction. Tran's fatty acids are rod shaped around the double bond due to the carbon chains on opposite sides of the double bond. This may explain the ability of cis fatty acids that have more ability of binding with WPI nanoparticles more than trans fatty acids. The results thus indicate that the cis conformation allows fatty acids a close stereo-specific fit, and the additional critical feature of the fatty acid is the carbon chain length. Fernandez found a significant decrease in surface tension when films prepared from whey protein isolate (WPI) together with were saturated and unsaturated fatty acids . The surface tension of milk systems is largely dependent on the milk mix and concentrations of surface active agents presents; adsorption of surfactants at the interface; and unfolding and denaturing of proteins. These may confirm that only a critical concentration of surfactant is required to produce maximum surface activity. Concentration of surfactants at the surface in excess of this critical concentration will be shielded from the air-water interface, and thus will not contribute to the measured effect . Milk proteins, milk fat and free fatty acids are the principal surface-active components that affect the surface tension of milk. An increase in these components at the surface will result in a decrease in surface tension. Conversely, denaturation of milk proteins on the surface of fat globules will increase surface tension as the protein is no longer an effective surface-active agent. Figure 1. Surface tension (mN/m) of different fatty acid solutions in glycine buffer (pH 9.0) either alone or as a complex with whey protein isolate (WPI 1mg/ml) by heating at 60°C/15 min. 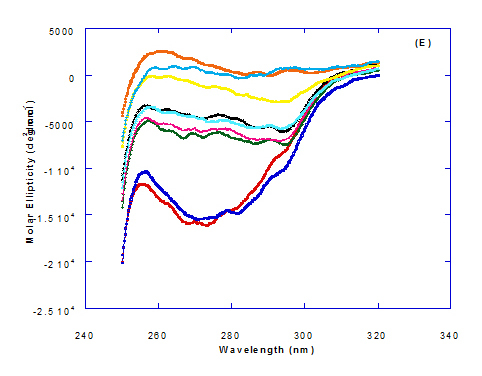 Spectra of heated WPI solution (1mg/ml in glycine buffer, pH 9.0) with different fatty acids (oleic, eledic, cis-vaccenic, trans-vaccenic and linolenic) in nano complex form circular dichroism (CD) was measured to confirm the changes in structure characteristics and the spectra is presented in Figure 2 and 3. The ability of WPI/oleic acid nanoparticle complexes to kill cancer cell has been shown to increase after losing the tertiary structure. 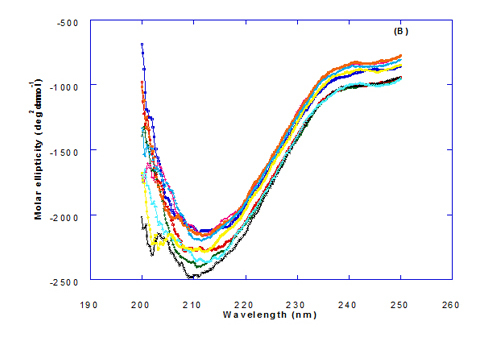 CD spectrum of WPI/OA complex at near and far – UV region is presented in Figure 2 and 3. 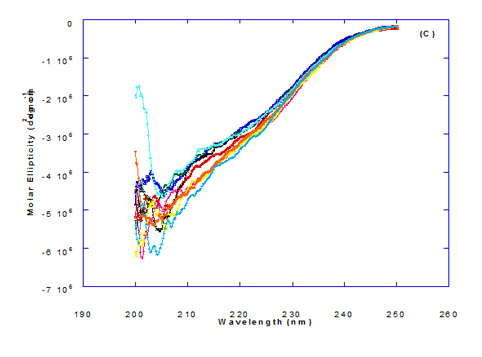 The spectra of WPI/OA nanoparticles in the near-UV showed the characteristics of a significant minimum signal (negative ellipticities peak) at 273.0 nm and a maximum signal (positive ellipticities peak) at 295.0 nm. Heated WPI in buffer solution (pH 9) with zero oleic acid had lower signal intensities compared to WPI/OA complex at higher concentration (50 molar ratio), indicating the loss of tertiary structure. These findings are very close to those of Kamijima et al. who found that the human α-LA had the characteristics of negative peak at 270 nm and a positive peak at 293 nm, indicating the rigid packing interactions of aromatic side chains. The lower signal intensities of heat treated WPI compared to native WPI is commonly indicating the loss of tertiary structure. 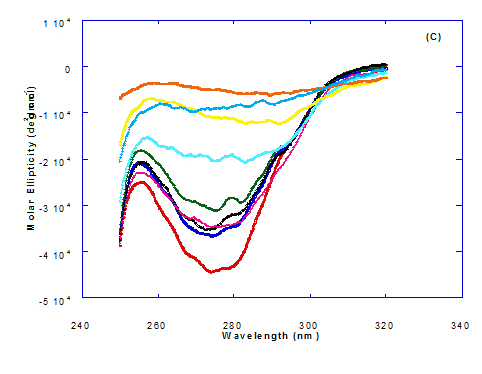 The CD spectra at far-UV region (Figure 3) of heated WPI solution either without oleic acid or as a nanoparticle complex showed significant negative ellipticities and a minimum signal (negative peak) at 206.7 nm. Kamijima et al. mentioned that CD ellipticity at 222 nm is commonly used as a measure of extent of secondary structures. 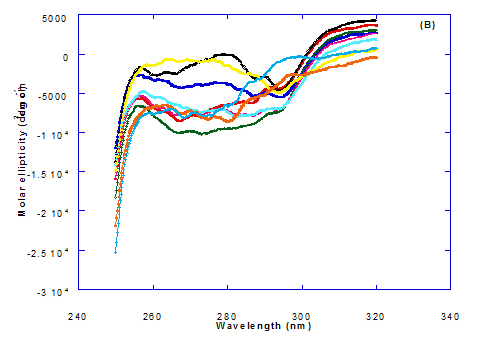 The spectrum of heat treated complex showed an increase in helicity form from that of native WPI. The ellipticity of WPI/OA complex was increased with increasing the oleic acid concentrations which means that the WPI changed from fold to unfold and lost the tertiary structure. Therfore, the ability of WPI/oleic acid nanoparticle complexes to kill cancer cell increased after losing the tertiary structure. The tertiary structures of WPI/OA complexes were thought to be completely lost from their CD spectra by increasing the concentration of oleic acid as noted in Figure 2. These results may indicate that structural features of heated WPI/oleic acid complexes are slightly different from that of HAMLet although their apoptotic activities resemble each other. The ability for complexes of WPI/oleic acid nanoparticles to kill cancer cell increased after losing tertiary structure and can be used to work like HAMLET or BAMLET. Interestingly, the peak intensities of the near-UV seemed to be correlated with cytotoxic activity. These results may indicate that the amount of the active components increases as WPI loses its conformation by increase the addition from oleic acid and heat treatment. The circular dicroism spectrum at near and far – UV region of WPI in complex with different concentration of eledic acid is plotted in Figure 2 and 3. It could be noted that the CD spectrum at near UV showed a minimum signal (negative peak) at 265.4 nm and maximum signal (positive peak) at 295.2 nm, which is nearly the same as WPI/oleic acid nanoparticle complex. In far-UV region, the CD spectra of WPI/eledic acid nanoparticle complexes Figure 3 showed minimum signal (negative peak) at 210 nm, comparing to 206.7 nm for WPI/oleic acid complex. It could be seen that all complexes of WPI/eledic acid were completely lost the tertiary structure. From the results obtained, one could notice that WPI can be partially unfolded by interaction with eledic acid after heating at 60°C/15min and loss the tertiary structures. Therefore, as a complex of WPI with eledic acid it might exhibit a citotoxicity effect (ability to kill cancer cell). The difference to that of WPI/OA these complexes need to higher fatty acid concentration to reach the complete lost of its tertiary structure. Figure 2. Circular dichroism (CD) spectra measurements of WPI as a complex with different concentrations of fatty acids (molar ratio) in the near-UV region. Figure 3. Circular dichroism (CD) spectra measurements of WPI as a complex with different concentrations of fatty acids (molar ratio) in the far - UV region. The circular dichroism (CD) spectra measurements of WPI with different concentrations of cis-vaccenic acid (molar ratio) in the near and far - UV region are presented in Figure 2 and 3. 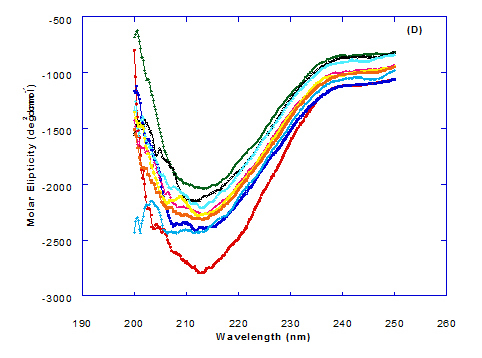 From the spectrum of WPI/cis-vaccenic acid complexes, it could be noted that the near-UV CD spectrum had a minimum signal (negative peak) at 273 nm and maximum signal (positive peak) at 294 nm. These observations are very close and nearly same as obtained with WPI/oleic acid complexes. The nano - complex of WPI/cis-vaccenic acid has completely lost the tertiary structures and showed very close signals as found with WPI/oleic acid. 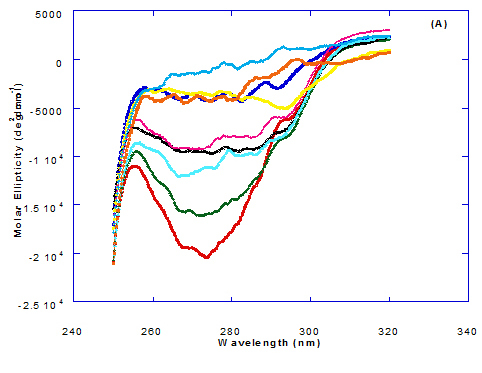 At far-UV, CD spectra of WPI/cis-vaccenic acid nanoparticle complexes (Figure 3) exhibited the minimum signal (negative peak) at 204 nm compared to 206.7 nm for WPI/oleic acid nanoparticle complexes. These observations indicate that WPI can also loss the tertiary structures and be unfold when making a nano complex with cis-vaccenic acid as a cofactor showing a citotoxicity effects as noted with HAMLET or BAMLET. The circular dichroism (CD) Spectra measurements of WPI with different concentration of trans-vaccenic acid in the near and far -UV region are presented at Figure 2 and 3. The signals pattern at near UV of WPI/ trans-vaccenic acid was slightly different than that found with previous examined fatty acids. From the near – UV spectrum of WPI/trans-vaccenic acid complexes it could be noted that the CD spectrum had a minimum signal (negative peak) at 279 nm, and maximum signal (positive peak) at 290 nm, which is nearly as WPI/oleic acid complexes. 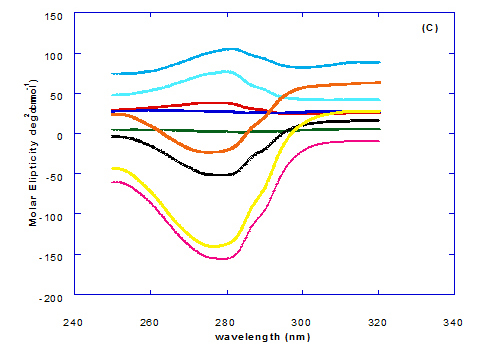 Spectra of WPI/trans-vaccenic proved that the complex lost the tertiary structures as figured with WPI/oleic acid. The only exception that to get the same conversion as WPI /oleic acid complexes, WPI have to bind higher concentration of trans-vaccenic acid than that of oleic acid. 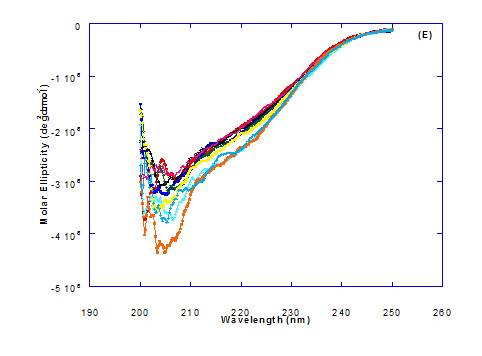 At far-UV, CD spectra of WPI/trans-vaccenic acid nanoparticles (Figure 3) showed minimum signal (negative peak) at 212 nm, while WPI/oleic acid nanoparticle complexes was at 206.7 nm. This indicate that WPI can be partially unfolded by interaction with trans-vaccenic acid after heating at 60°C/ 15min as cofactor and exhibit a citotoxicity effect. Data plotted in Figure 2 and 3 refer to circular dichroism (CD) spectra measurements of WPI with different concentration of linolenic acid (molar ratio) in near and far - UV region. The near – UV spectrum of WPI/linolenic acid complexes exhibited that the spectrum had a minimum signal (negative peak) at 266 nm, and maximum signal (positive peak) at 295 nm , with no significant differece compared to WPI/oleic acid nanoparticle complexes. It could be also observed that WPI completely lost the tertiary structures as found with WPI/oleic acid. Linolenic acid can bind and interact with WPI, and converted as same as conversion of α-LA/oleic acid complexes. The exception that WPI can bind higher concentration of linolenic acid. 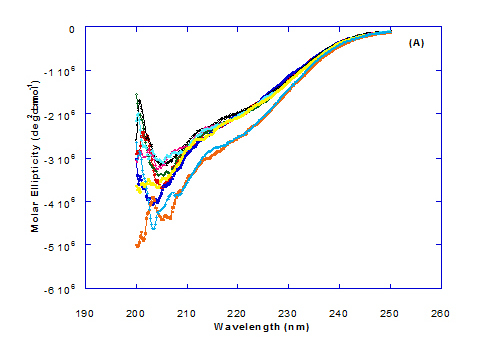 From far-UV CD spectra of WPI/linolenic acid nanoparticle (Figure 4B), the minimum signal (negative peak) was noted at 207 nm compared to 210 nm with WPI/oleic acid complexes. Therefore, WPI also loss the tertiary structures and be unfold by interaction with linolenic acid as a cofactor exhibiting a citotoxicity effect as HAMLET or BAMLET. Generally, the signal of CD spectra increased with increasing the fatty acid concentrations. Increasing the signal refers to the changes of protein (WPI) from fold to unfold conformation. Clearly, all fatty acid used have changed the structure and even WPI alone at (0.0) fatty acid concentration exhibited a structure change since it was heat before used. Our results are in agreement with previous research which clearly demonstrated that whey proteins form small disulfide linked aggregates when heated at low salt concentrations and neutral pH [15-19]. Changes in the collective secondary structures of WPI were assessed by CD spectroscopy. The binding of fatty acids with WPI have significant effect on the protein secondary structures of the WPI and the results of far-UV CD spectra indicated significant loss in protein secondary structural. The far-UV CD spectra of pre-extruded and freeze-dried WPI approximate an appropriate mixture of α-LA and β-lg with double negative peaks at 205 nm and 222 nm, similar but less well defined (especially at 222 nm) than that of pure α-LA . The turbiity measurements of different fatty acids at different concentration ratios in glycine buffer solution (pH 9.0) either alone or in the presence of WPI (1mg/ml) as a complex by heating at 60°C/15 min are illustrated in Figure 4. The data presented cleared that the turbidity was increased in the solution of fatty acids either alone or in a complex with WPI by increasing the fatty acid concentration. This was noticed in all turbidity measurements with different extent of all tested fatty acids. 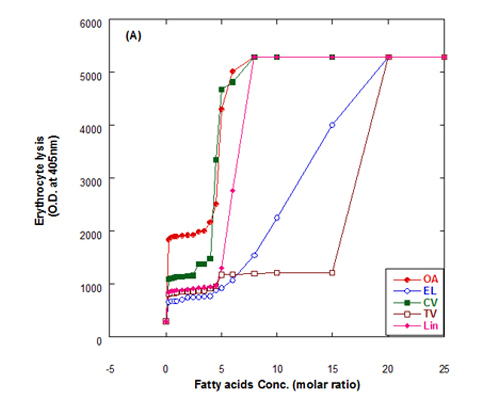 All formed fatty acid complexes presented lower turbidity measurements (Figure 4B) compared to the same fatty acid only (Figure 4A). The minimum turbidity for the fatty acids alone without WPI was observed with oleic acid while the maximum was observed in trans-vaccenic acid. 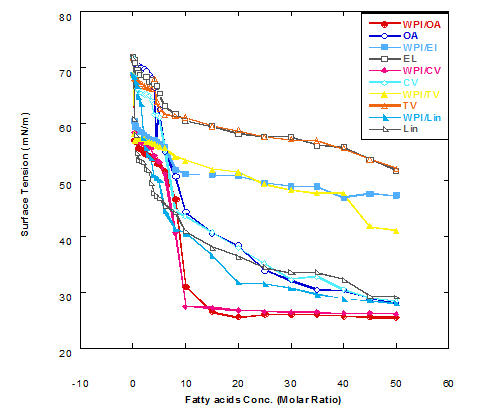 The complex of OA with WPI showed the lower turbidity values among all fatty acid complexes. Trans-vaccnic (TV) acid either alone or in complex indicated the highest turbidity measurements. The fatty acids in cis-form (oleic, cis-vaccinic, linolenic) showed lower turbidity measurements compared to that in trans-form (eledic, trans-vaccinic). Figure 4. Turbidity measurements of different fatty acid solutions in glycine buffer (pH 9.0) either alone (A) or as a complex (B) with whey protein isolate (WPI 1mg/ml) by heating at 60°C/15 min. These observations would explain that the presence of protein (WPI) in complex with fatty acid lowered the ability of fatty acid to aggregate in the solution. The higher concentration of fatty acids in the solution increased the ability to aggregate showed higher turbidity measurements. The turbidity of WPI/fatty acid nanoparticles was very low at all concentration of studied fatty acids which indicated that fatty acids did not form appreciable aggregates. A general observation could be noticed in our experiments that there were a lower turbidity measurements in all tested samples which could be explained to the higher pH value used (more than 8.0) in all solutions measured since it was adjusted to pH 9.0 using glycine buffer. Wangsakan et al. observed that there was no significant change in the turbidity of 1% maltodextrin solutions (instead of protein) when SDS (instead of fatty acid) concentration increased from 0 to 20 µM, which suggested that there was no appreciable aggregation of complexes and no thermodynamic incompatibility of the components . The lysis of erythrocytes (O.D at 405 nm) by addition of either fatty acids only or WPI/fatty acids complexes after incubation for 3 h at 37°C is presented in Figure 5. The obtained data indicated that the WPI/fatty acid complexes had more efficiency to lysis the erythrocytes than fatty acids alone. The erythrocytes lysis increased by increasing the fatty acid concentrations either in presence or absense of WPI. It could be also seen that at the low oleic acid concentration the complex of WPI/oleic acid showed slight lysis but still higher than that of WPI in buffer only. Figure 5. Cutotoxic activity measurements as erythrocytes lysis happen after adding either fatty acid alone (A) or WPI/fatty acid complexes (B) at pH 9.0. The complex was more effective in erythrocytes lysis than fatty acid alone although, the fatty acid only has an effect on erythrocyte lysis too. The complete erythrocytes lysis has been appeared at low concentration of OA alone or in complex with WPI compared to other fatty acids. The fatty acids in cis conformation showed highest activity than that of fatty acids in trans conformation. Therefore, the lowest erythrocyte lysis was observed when eledic acid was used. To clear the previous observations, for example complete erythrocyte lysis appeared at concentration 4.5 molar ratio of for oleic acid (OA) in nano complex with WPI while in absent of WPI the complete lysis occurred at higher oleic acid concentration (8 molar ratio). On the other hand, the complete lysis approximately happened at the same concentration with cis-vaccenic acid while it happened at 15 molar ratio with complex of WPI/TV (trans-vaccinic) and 20 molar ratio with TV alone. The cytotoxicity was higher in complexes than fatty acids only. In general, all Complexes prepared of WPI/different fatty acids showed cytotoxic effect in different extent depending upon the type and concentration of fatty acid. The cytotoxicity of the complexes increased with higher numbers of fatty acids per WPI molecule. The fatty acid alone in buffer solutions showed also a cytotoxic effect to less extent as in complex with protein. The cytotoxic function of the WPI/fatty acid complexes was similar to that of HAMLET and clearly formed apoptotic complexes where heat treated. However, heat treatment changed such a mixture to a cytotoxic component . There is no consensus as to whether the cytotoxicity can be ascribed to a synergistic effect of α-LA and OA or exerted per se by either of the two components . The results agree with Svensson et al. who suggested that only complexes between protein (α-LA) and unsaturated fatty acids in cis conformation can induce cell death . Complexes between α-LA and either OA or VA were reported to be the most active causing 100% and 99% cell death, respectively. The cytotoxicity of the complexes was correlated to the number of fatty acid per protein, with more fatty acids per protein being more cytotoxic. Gunasekaran S, Xiao L, Ould Eleya MM (2006) Whey protein concentrates hydrogels as bioactive carriers. J Appl Polymer Sci 99: 2470-2476. Robb ID (1981) Surfactant Science Series, vol. 11, Anionic Surfactants, In: E.H. Lucassen-Reynders (Ed), Dekker, New York. Adamson AW (1990) Physical Chemistry of Surfaces, (5thedn) Wily, New York. SAS (1998) User’s guide. 6.12 edn, Statistical Analysis Systems Institute Inc. Cary NC 27511-8000, USA. Fernandez L, Apodaca ED, Cebrian M, Villaran C, Mate JI (2007) Effect of the unsaturation degree and concentration of fatty acids on the properties of WPI-based edible films. Eur Food Res Technol 224: 415-420. Walstra P, Jenness R (1984) Dairy Chemistry and Physics. PP: 211-214; John Wiley and Sons, Toronto, Ont. Marangoni AG, Barbut S, McGauley SE, Marcone M, Narine SS (2000) On the structure of particulate gels—the case of salt-induced cold gelation of heat-denatured whey protein isolate. Food Hydrocolloids 14: 61-74. Hoffmann MAM, van Mil PJJM (1997) Heat induced aggregation of ß-lactoglobulin: role of the free thiol group and disulphide bonds. J Agric Food Chem 45 2942-2948. Sawyer WH (1968) Heat denaturation of bovine ß-lactoglobulins and relevance of disulfide aggregation. J Dairy Sci 51: 323-329. Shimada K, Cheftel JC (1989) Sulhydryl group/disulfide bond interchange reactions occurring during heat-induced gelation of whey protein isolate. J Agric Food Chem 37: 161-168. Qi PX, Onwulata CI (2011) Physical properties, molecular structures, and protein quality of texturized whey protein isolate: Effect of extrusion moisture content. J Dairy Sci 94: 2231-2244. ©2014 Hassan ZMR. This is an open-access article distributed under the terms of the Creative Commons Attribution License, which permits unrestricted use, distribution, and reproduction in any medium, provided the original author and source are credited.